I found the recipe for this sandwich on Pinterest (I think) and it came from a blog called She Wears Many Hats which is a great blog which I hope you visit. This is now my favorite sandwich so thank you!! Back to the sandwich. First of all, I am NOT a fan of grilled cheese and what compelled me to make this sandwich, I have no idea. However, I DO love roasted onions and mushrooms and that is what probably spurred me on. The combination of ingredients is perfect. It is very easy to make so it meets my criteria but it does take a bit of time to roast the vegetables. I am going to make another today for lunch but I am using Dubliner cheddar instead of the gouda for a change. On a baking sheet, mix the sliced mushrooms and onions with the olive oil. Season with a little salt and pepper. Roast in the oven for about 20 minutes or until done to your liking. Just don’t let them burn. When finished, remove from oven and set aside. On the stovetop in a large skillet, melt the 4 tbsps of butter over medium heat being careful not to burn. While the butter is melting assemble sandwiches. 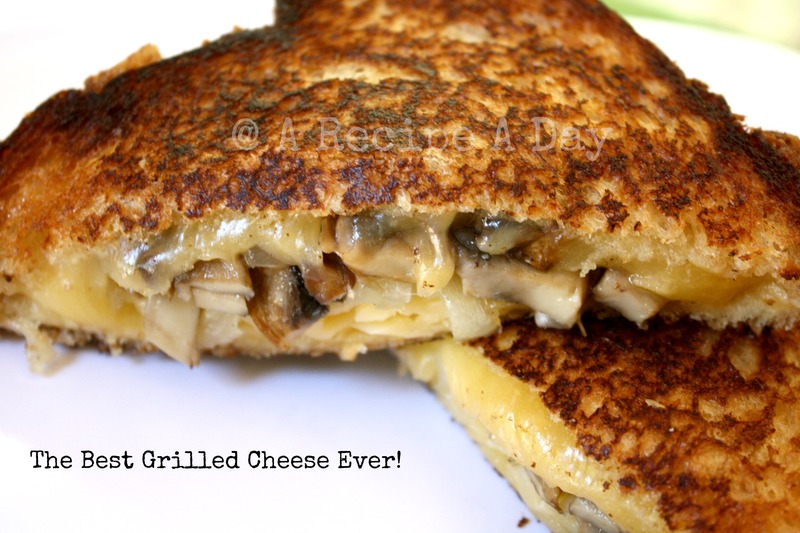 On one slice of bread, layer the gouda, some onions and mushrooms, another layer of gouda. Top with another slice of bread. Repeat for second sandwich. Carefully place sandwiches in skllet and let toast, being careful not to burn the bread. Flip and repeat for other side of bread. Cook until cheese has melted and bread is toasted. Please don’t forget to enter my giveaway for one copy of Gooseberry Patch’s cookbook Hometown Harvest. To enter, click here!! I wonder if roasted peppers would also work? Mushrooms on grill cheese. I like it! Sounds so good. Gonna have to try it. That is one great looking veggie melt! Now I’m hungry.